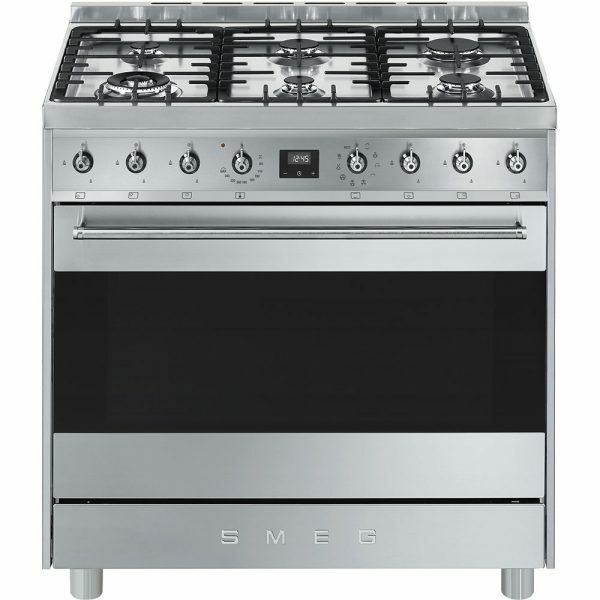 The smeg Symphony Cooker range, has square cooktop corners and classic control knobs to ensure a stylish look. The heavy duty cast iron pot stands provide sturdiness. The electric oven ensures better heat distribution with a Thermo-Ventilated Fan. Ten cooking functions allow you to cook foods in a wide variety of ways on your Smeg cooker. Arrange food in your 126 litre oven on any of the 5 cooking levels to cook all your favourite foods at the same time. Gas cooking zones provide immediate heat. Automatic electronic ignition, and flame failure safety valves ensure you and your family’s safety. Vapour Cleaning can be used to perform two functions. Either to cook food with bottom heat only (when no browning is required) or to clean the oven in an eco-friendly way. This system is enabled by spraying a small amount of water around the cavity which is vaporised using the bottom element. Full-width storage compartment is also accessible at the bottom of the Smeg cooker to store all your kitchen tools. W 900 x D 600 x H 915 mm.